In today's comic the frogs are recycling pictures into memes, and by clicking on the meme in the last frame you can create your own frog meme. You just type in your own text and your personalized meme appears. You can even share it. I don't want to get into a debate about how the sharing of memes has destroyed what remains of our humanity - it's just a comic about frogs. The interesting thing is how I was able to find a meme generation API that I could work with to make this comic possible. My first attempt at this used memegenerator.net. It's a very popular meme site. They have a JSON API and there are even some modules for Node.js that interface with it. That all sounded good. I tried out the node-meme module and it worked - for all the read methods. Once I tried to create a meme with it I was informed by an error code that I needed valid login credentials. No problem! I'll just register for an account. Or not. Apparently, account registration has been unavailable for quite some time. All attempts at it result in a rather unintelligible error message. There goes that plan! After some more searching I found Imgflip.com. 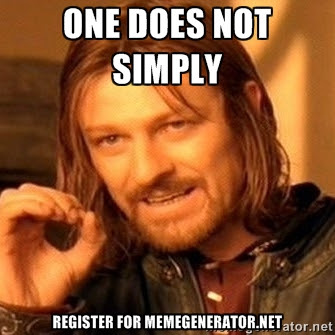 They have both a meme-generation API and functioning account registration! Yeah! To make the comic work the way I intended, I needed to make all the memes from my server and then just update the browser with the Imgflip URL. This prevents everyone who uses the comic from having to get their own account, but it makes things a little more complicated for me. I essentially had to set up a meme-generation proxy. Your browser POSTs data to my server, my server POSTs data to Imgflip, Imgflip generates a meme and tells my server the URL, and finally my server tells your browser the URL. 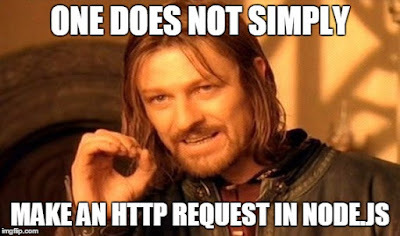 This also required me to do something I haven't done a lot of before - use the Node http client. Sure, I've done simple things with it in the past, but the out-of-the-box features make it a bit difficult to use when you want to access a REST web service. text1 : "but i have no idea what's going on"
Simple, right? The first parameter to request.post is the URL. The second is what to POST. In this case, I want to POST a form, specifying the form data as an object. Imgflip only accepts form data as input, and every POST must include your username and password. You get those by registering on their site. The template_id form field is the id number for the meme image you want to use. If you upload your own meme template images, you can find the id numbers on template details page linked from your account. The text0 field is the text for the top of the image, and text1 is for the bottom. The third parameter is the callback function for when the POST completes. This function gets an error (if there was one), the response object for checking the status code (and other stuff if you want), and the body of the response. In the case of the Imgflip web service, I know the body will be JSON. In this example I just log the meme image URL. That is much simpler than doing it the purely native way. I recommend the request module if you need to do any kind of REST API access and there's no custom client available. Now the fun begins: frog memes for everyone! 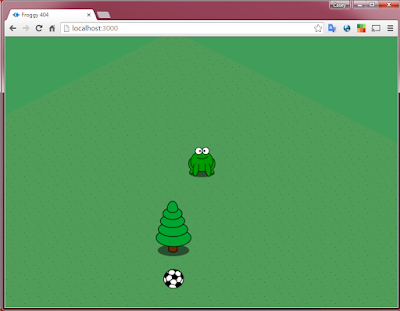 The frog soccer game made with Phaser is coming along nicely. After getting the ball-out-of-bounds logic working pretty well over the weekend I was thinking more about the opponent logic. The pattern followed by the other frog seemed to work but was too simple. I wanted something a little better. The frog should pick a different target location based on her position relative to the ball, but there are a lot of zones to consider. Is she directly in line with the ball on the X or Y axis? Is she below the ball on the Y axis? Is she on the goal side of the ball? What should be done to get her to the next location? When dealing with these kinds of problems I find it helpful to draw a picture. I keep a graph paper tablet around for times such as these. 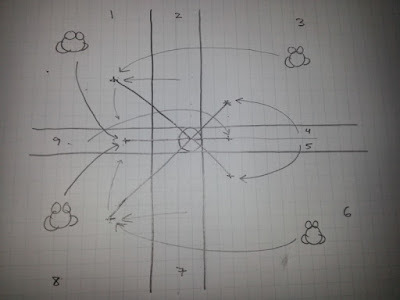 I sketched out the different zones the frog could be in relative to the ball and what I believed the target should be when in each of those zones. After that, it was easy to translate these behaviors into code. Making the sketch plan in advance made it much easier to code, and it worked well on the first try. It still needed some fine-tuning, but it was really close. I know I could have combined some things in the code above but I wanted to keep the logic very clear and clean so I could tune it. If necessary I can always optimize it later. I tend to favor readability over other factors. I made another video of the frogs playing. The computer-controlled frog starts out on the right side of the ball but moves herself around to the left and starts moving toward the goal. She chases it quite well when I manage to kick it away from her. Remember, the full source code is on GitHub if you want to try improving the logic. Maybe I don't have any goals in real life, but I do now have goals in my 404-page Phaser game. Soccer goals. If you've been reading the blog for the last week or so, you'd know that I am working on a game for the Amphibian.com 404 page - frog soccer. It really doesn't have anything to do with a 404 page, but my kids liked the idea. I have been very time-constrained this week, so the only things I've added since Wednesday is a new tilemap with field tiles that look like an actual soccer field, and the goals. 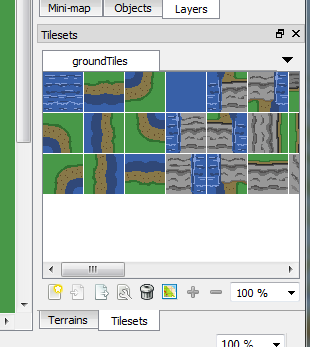 The new tiles were as easy as drawing some new squares in GIMP and using Tiled again (see Monday's post). But the goals were slightly more interesting. My goal for the goals was simple. Using an image of the side of the goal (with net) and an image of the top of the goal (again, with net), I could draw the side twice and the top once to create the appearance of a goal viewed from the standard top-down angle. The frog or ball or whatever should be able to walk into the goal and appear under the net. Here are some pictures to illustrate what I'm talking about. The side of the goal. Used twice per goal. The top of the goal. Drawn above the two sides. The frog standing behind the goal. The frog standing in the goal. She appears under the net. The sides of the goal were simple. Just like the trees, I can create them as sprites and give them custom collision bodies. The frog will be able to walk in front of and behind them normally because of the group.sort('bottom', Phaser.Group.SORT_ASCENDING) call on each update. Just like the trees. But what about the top of the goal? And the net that hangs down from it? It should always be on top. The key is to not put it in the group. The way I create the top-down effect in the game is to draw the objects that are closer to the bottom of the screen on top of things that are closer to the top. The group.sort() function takes care of this. But that sorts inside the group only. Any other object created before or after the group will always draw either under or above the group. 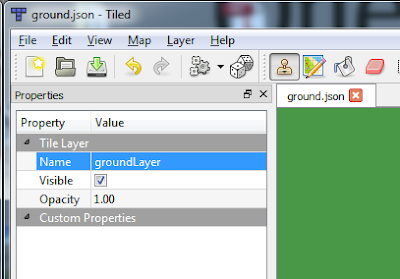 In my create code above, the first thing I do is create the ground tiles using the tilemap. The very next thing I do is create the group for all the sprites. Now everything in the group will draw above the ground. If I were to move the game.add.group() call to before the game.add.timemap() call, all the sprites in the group end up below the ground. They are there but can't be seen. I realized this the other day when I was playing around with tilemaps for the first time. 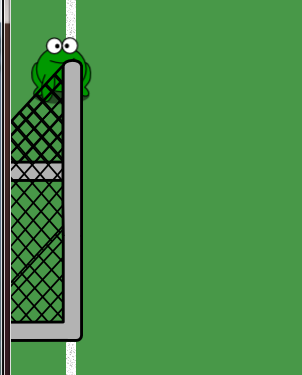 So all I have to do to make sure that net is always on top of the goal sides and the frog is to add it to the game after the group. Objects can be added to the group after the net is added, but the group itself must simply be created first. Remember, the complete source to the game is on GitHub if you want to try things yourself. I think there's a way to change the draw order of things after you create them, but I haven't been able to get it to work yet. Maybe more on that later. For now, enjoy today's confusing comic about confusing organizational structure. Up until now, my Phaser-based 404-page frog soccer game hasn't been much of a challenge. You just move the frog around the bump the ball. In a real game of frog soccer, there would be at least one opponent trying to take the ball away from you. Today I tried to add such an opponent. Adding another frog was the easy part. 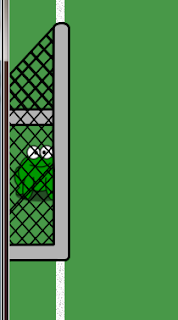 In my create function, I just create a new sprite (named otherFrog) using the same sprite image as the first frog. With the exception of the starting position, all of its settings are the same as the first frog. The only difference is that I set a boolean value called chase to true. This will be one of the flags I use to control the new frog's behavior. When chase is true, it means the frog should be chasing the ball and trying to line herself up for a shot. Yes, I've decided that the frogs in this soccer game are female. Women's soccer is very popular at the moment in this country, and the frog soccer was my daughters' idea. I specify a function as the third parameter to game.physics.arcade.collide that gets called when any two sprites collide. In it, I check to see if those two sprites happen to be the ball and the opponent frog. If she did touch the ball, I turn off her chase and kick modes, wait 250 milliseconds, and then put her back into chase mode. If she's in chase mode, I check to see if she's on the left side of the ball. If not, I set her target location to be her current y-coordinate and the ball's x-coordinate minus 100. This will move her to a good position on the left side. If she's already there, I check to see if she's lined up with the ball on the y-axis. If she's not within a 25-pixel zone near the ball, I set her target position to be the ball's x-coordinate minus 100 and the ball's y-coordinate minus 25. When she gets there, she'll be lined up perfectly for a kick. Which is why I turn off chase mode and turn on kick mode if neither of the first two conditions are true. 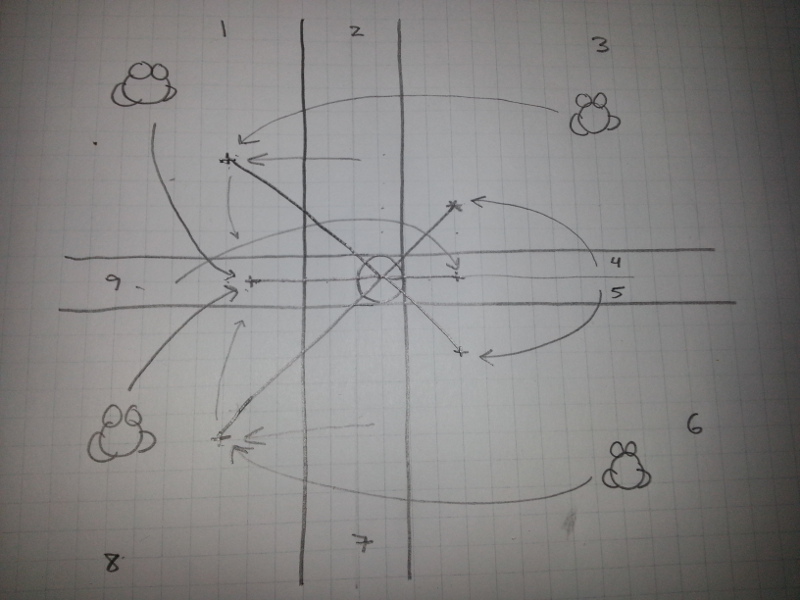 After I determine the new target, I use the game.physics.arcade.moveToXY function to make the frog move towards that position. Since this function gets called pretty much constantly, she'll continuously be re-targeted towards wherever the ball might move to. If she's in kick move, I simple use the game.physics.arcade.moveToObject function to make the frog move directly to the ball's position. This will result in her colliding with the ball, which will kick the ball, turn off chase and kick modes, and set the timer for a return to chase mode. Here is a short video I made of the game in action now. It's not perfect yet, but you can see how the other frog tries pretty hard to get in my way and take the ball. Obviously, I still have a way to go here. Those frogs still need some animation of their own, and I need to add goals and make the ground tiles actually look like a soccer field. I only have a few minutes each day to work on it, so whatever little progress I make is good. Remember that the full source code is on GitHub if you want to play around with it yourself! Don't forget to read today's comic...and if you have a minute do me a favor and vote for Amphibian.com on the Top Webcomics site. Here's the link: Amphibian.com Voting Gateway. I mentioned last week how I am finally starting to work on my 404-page game for Amphibian.com. And while I'm doing this I will be learning a new HTML5 game framework, Phaser. Phaser is a very popular choice for creating modern games for the web browser. It supports both "regular" Canvas and WebGL, and also has mobile optimization as one of its core principles. I thought it would be a good thing to learn. I want to train now for the GitHub Game Off 2016 (assuming there will be one!). Phaser is a modular framework that supports third-party plugin modules, and while browsing through the Phaser tutorials and documentation I came across the Isometric plugin. It claims to allow easy creation of isometric 3D-style games projected onto the 2D Phaser canvas. The demos looked good, and I've always loved the isometric style so I thought I'd give it a try. Today, I will document my experiences so far. // set world size, turn off physics, etc. // setup game elements here. // create sprites, controls, camera, etc. // check for collisions, etc. The key parts here are that as soon as the page is loaded, you can create the game as seen on line 6. Since by default Phaser will create the Canvas element for you (note that the HTML page is pretty much empty) it needs to know the dimensions. Using window.innerWidth and window.innerHeight will create a full-window game experience. Lines 8, 10, and 12 are setting up a BasicGame class and giving it a function called Boot. This function will handle a game state, and in this simple game there will be only one state. The prototype for the Boot function contains four basic methods: preload, create, update, and render. Those are where you put the actual game code. Lines 49 and 50 set the Boot class to a game state and then start that state. Now to write some actual game code. What do I want my game to do? A lot of stuff, but I have to start small. 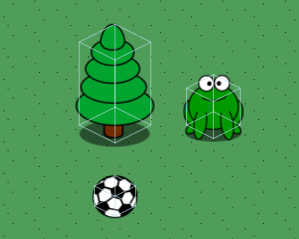 To demo, I am going to make an area with a tree, a soccer ball, and a frog. The player can move the frog around with the arrow keys and kick the ball. Sounds easy, right? Loading images is fairly straightforward. The first parameter is the key to use later when making sprites and the second parameter is the path to the image. 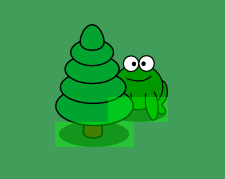 I have tree, ball, frog, and ground tile images. After that, it's just a matter of adding the plugin, setting the physics system, and setting up the world size. // Set up our controls. The first line sets the game's background color. This is what you see covering the whole Canvas element when there is nothing else drawn there. I use a kind of green color, slightly different from my ground tile so you can see the difference. Next, I create groups for the different sprites. Grouping them makes it easier to manage different types of objects. The ground tiles do a lot less than the tree and ball, for example. And speaking of the ground tiles, that's the first thing I add. In a pair of loops, I just cover the entire world area with them. The more interesting parts are next. I create a tree sprite by calling game.add.isoSprite and give it the x, y, and z coordinates along with the id of the image, frame index (always 0 because I don't have any animation yet) and the group for this object. For both the tree and ball objects, I enable the isoArcade physics and enable colliding with the world bounds. I don't want the ball being kicked out of the world! The ball as two additional settings, bounce and drag. They are exactly what they sound like - telling the physics engine that the ball should bounce a certain amount when hitting another object and that it should have decreased friction to roll around on the grass. Setting up player controls is relatively simple as well. Phaser has built-in support for capturing the cursor keys and using them as game input. This just sets up the capture, using them will be in the update function. Finally, the create function makes the player sprite and sets up its physics much like the tree and ball. The camera is set to follow the player on the last line. This will keep the frog in view as you move around the field. If you view the game now in your web browser, you should actually see something! But you can't move yet, because we still have to do the update function! The contents of the update function are very simple. Just check for a cursor key pressed and change the velocity of the player. The Phaser engine takes care of the rest! One weird thing here is that I set both x and y velocity for each cursor direction. This is a personal preference and side-effect of the Isometric plugin. In the Isometric view, moving on the X-axis alone moves the player both up/down and left/right but at a 45-degree angle. Same thing for Y-axis movement, but the slope is reversed. It makes sense when you think about it, but I prefer the player motion to match the cardinal direction of the keys. To correct for this, I set both the x and y velocities in each case. The only other things that happen in this function are the collision checks and topological sprite sort at the bottom. These are things that the Isometric plugin takes care of for you - you just have to call them. That's what I have so far. The frog can move around the play area and kick the ball. Collisions with the tree, ball, and world edges seem correct. It plays ok on my desktop but the frame rate is not all that good on my phone. I think it might be the Isometric plugin that really slows it down, because most of the Phaser demos performed quite well on mobile. I can't really say if I'm totally sold on Phaser yet...I might have to try making something without the Isometric plugin to see if I really like it. I need to work on animations next, and look into that topological sort bug some more. I don't have this up anywhere to play yet publicly, but that should come soon. In the mean time, take this code and set up your own game! And don't forget today's comic! The tadpoles that have been in the comic this week have actually been hanging around for quite a while. They actually pre-date the entire comic. I created the tadpole image back in November 2013 as part of my first entry in the GitHub Game Off. I did write a post about that game back in December 2013, but it wasn't nearly as detailed as my posts concerning my entry in this year's Game Off. When I was thinking about the game, I was reminded of one of my unfortunate personality traits: I have to do everything the hard way the first time. "That doesn't sound so bad," you might say to yourself. But for a game competition it probably put me at a disadvantage. I could have spent more time making the game play better instead of fixing bugs with the keyboard inputs. There are more lines of code in the 2013 game despite it being much more basic. Why am I like this??? It's not just online games. I stubbornly kept implementing my own CSS manipulation functions for years before I finally decided to start using jQuery (well, I actually used Dojo first but eventually switched). I think it really just does come down to my stubbornness. I like to do things for myself. Even when that wastes time. I need to work on this. 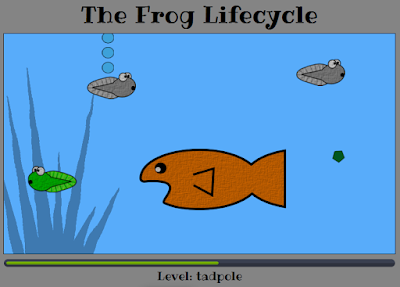 You can still play the 2013 tadpole game. Even though it's 100% hand-crafted, it wasn't such a terrible game. It didn't win, though. So check out the tadpoles in today's comic. This might be the last time they appear for a while. I'm not sure where that train goes. One of the best things about functional programming with Node is how simple it can be to perform lots of potentially slow functions asynchronously. That's also one of the worst things. It's very easy to write really bad code or code that doesn't act the way you expect if you lose sight of the asynchronicity of it all. Fortunately, there are great utility packages like async that make it simple to write good code that acts properly. Take the following example. Let's say I have a web service that performs some function to its input and returns a new value. For test purposes, let's use the following Node+Express web application that has a single route which reverses a given string. Now if I have another application that wants to call that reversal web service with 1000 strings and wait for them all to complete before moving on, what should I do? Making HTTP calls is an asynchronous operation. I make the call and then supply a callback function to let me know when it finishes. Here's the code that sets up the test: a function that makes the web service call and invokes a callback when complete, and an array of 1000 random test strings. First look at what is probably the most commonly used - and incorrect - way of making all the web service calls. The problem is that you have no idea when all the calls complete. The console.log("finished!") is output almost immediately after you start the program, and the individual logs of the backwards strings keep coming out. Don't do this. // ----- does everything in series. //       really slow, but you know when it's finished. Defining a wrapper function that makes the call to reverseIt and then calls itself in reverseIt's callback does allow you to know when all 1000 calls have completed. But doing one request at a time invalidates all the performance gains made possible by the asynchronous nature of the http calls. The console.time and console.timeEnd functions will be used as proof of how this is the worst of the "correct" methods. In my local tests, the complete set of 1000 string reversals took on average around 675 milliseconds. This method creates a manager for reversing all the strings that will only invoke a callback when all have completed. To keep track of how many have finished, it sets up a closure with a counter variable and returns an object containing a function to start the process - the go function on line 7. It loops over the array of strings and calls reverseIt on each one, much like in the incorrect example above. But in this callback function for reverseIt, the counter variable is incremented and then checked to determine if all have finished. If they have, the manager's callback is invoked. That's the point when we are sure that all 1000 have completed. The timing on this method proves that it completes much faster - my tests averaged 203 milliseconds. Async has a bunch of methods for different patterns, but the each function corresponds to the desired behavior in this example. It takes three parameters. The first is the array of items, and second is what they call the iterator function. This function is called and passed each item as well as a callback. The general contract is that the iterator function should do its thing and then call the callback when complete. The third parameter to each is the callback function for when the entire array has been processed. The timing indicates that async's each function performs exactly the same as my own function, but is much more generic and allows me to write fewer lines of code. That's a win-win! Follow my example and use the time you save by writing less code to enjoy today's comic! Sarcasm is the topic of today's comic. Particularly how the use of sarcasm can be associated with a certain level of intelligence. I remember when my daughter was first able to understand and even use sarcasm around age 8, and I've heard that losing the ability to understand sarcasm is one of the signs of losing your mind. Sarcasm is quite common in our spoken language, but is difficult to handle in writing. Why can we easily express questions or exclamation in written language but not sarcasm? All are basically just different kinds of vocal inflection when said aloud. How is it that there is no punctuation to represent sarcastic tone? It has been proposed in the past. 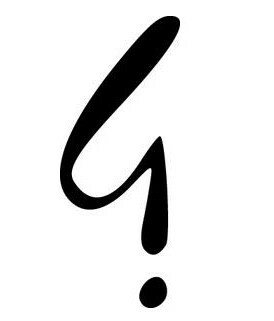 As early as the 1580's, writers were using a kind of backwards-looking question mark called a percontation point to represent ironic sarcasm. You've probably never seen a percontation point, because despite having a Unicode definition most fonts deem it so obscure that it is not rendered. And it's not a perfect solution because it would only be applied to irony, and not all sarcasm is ironic. Other proposals over the years have included text with a reverse slant to normal italics, a question mark inside square brackets, and using a tilde at the end of a sentence. Obviously, none of these ever caught on. So today sarcasm is left to be conveyed using the fake <sarcasm></sarcasm> HTML tags or as a #sarcasm hashtag addendum to a phrase. Why does it have to be this way? Something as basic to the English language as sarcasm should have a first-order representation in our written language! The <sarcasm> tag should have a real rendering in a page, just like bold or underscore or italic. Since I try to push the limits of both web comics and the English language, I have decided to use the aforementioned tilde to represent the sarcastic statements in my comic. I believe that it is the best choice of all the existing proposals. It exists on a normal keyboard layout and is not a composite of other punctuation, nor does it require any special visual rendering. If everyone starts doing it, we can finally allow sarcasm to take its rightful place in our written language. Join me, and together we can make the world a more sarcastic place! To do a fair comparison between Snap and jQuery SVG, I performed the same task with both libraries. I have a really wide SVG scene with some frogs in it. The viewBox restricts the viewable part of the scene but changes when you click on one of the frogs. Here is basically the same HTML/SVG I used on Wednesday, with most of the SVG cut out to save space. The difference from Wednesday's jQuery SVG page is obviously the script at the bottom. I am including the snap.svg.js file (there's a minified version available too) but unlike the jQuery plugin, Snap does not need any CSS. I therefore don't have any stylesheets included in this one. I am still using jQuery though, but just for the convenience of the function that can be called when the DOM is ready. Snap does not itself rely on jQuery. // as the bounds object! On line 3, I get a Snap object that represents the SVG root element. The Snap() function takes as a parameter a selector much like jQuery does for finding the SVG elements on the page. Lines 5 and 6 (and the comments on 8 and 9) have no bearing on the rest of the code, but I wanted to include them just for informational purposes. The Snap.attr() function is a way to get attribute values for SVG elements. But when calling s.attr("viewBox"), Snap is smart enough to return a special object representing the viewBox, not just its String value. Nice. This is different from calling s.getBBox() however. The .getBBox() function returns an element's bounding box. In the case of my SVG scene that means an object representing the entire width, not just the currently visible portion. Just wanted to point that out. I was impressed. Continuing on, lines 11 and 12 get the frog objects from the SVG. Notice how you can call Snap() directly to get these - you don't need to pass a reference to the root SVG node or anything. This is quite a departure from jQuery SVG. Once I have those objects, setting up click event handlers follows a pattern much like jQuery event handlers. Lines 14 and 18 are examples of that. Animation of the viewBox change is also nicer than with jQuery SVG, in my opinion. Snap SVG Element objects (above, s, ceo, and sci are all Elements) have an animate function which is quite similar to jQuery's. To animate a property of the element, you just specify it in an object along with its target value. In my example I am animating the viewBox attribute by specifying the String value I want it to be when the animation finishes. This is done on lines 15 and 19. 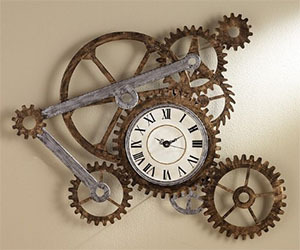 The second parameter to the animate function is the length of time in milliseconds that the animation should last. Again, this is just like jQuery. The third parameter is optional but specifies the animation's easing function. By default, a jQuery animation easing looks more like the Snap easeinout easing so I specified that to make them match more closely. What's my conclusion after comparing these two SVG libraries? While the number of lines of code needed to perform the simple click-to-animate-the-viewbox action was basically the same in both versions, I think the Snap API makes more sense. Snap's documentation is also much better than jQuery SVG's. Even so, I wouldn't mind seeing a few more demos linked directly from the documentation (there are some cool demos, but no easy way to view the code behind them), and that viewBox object behavior doesn't even appear to be documented (at least I couldn't find it). After using both to perform the same task, I have to say that I prefer Snap and think I will use it going forward. I would also recommend it if you want to manipulate SVG on a web page. It has a ton more features that I've shown here - this example is extremely basic! Give it a try for yourself. And enjoy the holiday weekend, if you live in the United States. Enjoy the regular weekend if you live anywhere else in the world. I know I've been writing more about SVG lately. This is because I am working on a new design for caseyleonard.com that is basically all SVG embedded in an HTML page. But static content is boring! I want a website that moves or something! First of all, I will report that the online documentation for jQuery SVG is not the greatest. I found the site navigation to be confusing and explanations of the code samples were hard to understand. There are some good demos, but it's not exactly clear why they work in all cases. I had to do a bit of experimentation in order to figure out the basics. My goal was to have a very wide scene rendered via SVG. You can only see part of the scene at any given time because of the viewBox settings. Clicking on some elements in the SVG will cause the viewBox to scroll a new part of the scene into view. Here is a stripped-down version of the HTML page. Most of the SVG has been removed so save space. At the bottom, you can see the jQuery and jQuery SVG imports. jQuery SVG is very modularized - you need to include the base plus any of the different sub-modules you wish to use. I am using the DOM module to allow me to access the DOM of the SVG much like the DOM of the HTML. I am also using the Animations module to allow me to use jQuery animation with the SVG attributes. Also note that there is a small CSS file included as part of the jQuery SVG package that you'll want to include. Everything is wrapped in a function that gets called when the page is fully loaded. The first thing that must happen is that the SVG code must be initialized on the SVG element in the document. There on line 5, I used the standard jQuery selector to get the SVG element by id and then call .svg() on it. After that, I can get an SVG object by calling .svg("get") on that same element again. You need the svg object in order to make calls to find elements inside the SVG. See lines 7 and 11 where I set up click listeners on two of the objects in the SVG scene (a picture of CEO Frog and a picture of Science Frog). The object returned from calling svg.root() must be passed as the second parameter to the normal jQuery selector function in order for it to work properly. Finally, likes 8 and 12 reveal how to animate the viewBox of the SVG. Using the selector for the SVG root element and a call to the standard jQuery .animate() function, it is possible to create a smooth scroll transition between two viewBox configurations. The most important thing to realize is that you can't use the parameter "viewBox" as input to the animate function. You have to animate the "svgViewBox" attribute instead. I know, there is no actual attribute in the document named svgViewBox. It's just viewBox. But the SVG attributes have special names (mostly the same names with "svg" at the beginning but not always - see the documentation) that you must use for animation purposes. The viewBox attribute is made up of four numbers. The first two are the x and y coordinates for the top left corner of the viewBox. The next number is the width of the view and the last number is the height. In my animation, I change the first number to add 500 each time, which essentially scrolls the view sideways by its width. I don't know about you, but I find the API for this module to be a bit odd. Yes, I got it to work, but I didn't really feel good about it. Bottom line: I think I'm going to try Snap.svg next before I make a decision on what to use.